The quinoa boat had well and truly sailed by the time I got on board and started to cook and eat it regularly. In the nineties when quinoa first became available in Australia, I tried cooking it and it was just awful – bitter and slimy – it was nothing I wanted to try again. I was still a bit scarred from that experience when quinoa became the new ‘it’ grain. When I found out quinoa needed to be rinsed before cooking to remove its bitter coating and make it palatable, I decided to try it again. So I cooked it again… and again…. and then again, but I really couldn’t see what all the fuss was about. It wasn’t bitter and slimy but it was just kind of soggy and, well, tasteless. I would have left it at that but about a year ago, I got a take away roasted vegetable and quinoa salad from a food bar and I finally ‘got’ what everyone had been talking about. Quinoa, when it’s cooked right, has a subtle nutty flavor and grainy texture that makes it difficult to stop eating. I don’t know whether it’s the placebo effect of its ‘super food’ reputation, but eating a whole heap of quinoa makes you feel kind of… well… super! I had to find out how to make it properly. Most instructions for cooking fluffy quinoa use an absorption technique (as with rice) and while some people seem to have success with this method, my quinoa still turned out both soggy and undercooked. Finally, I came across a technique for cooking perfect quinoa via the Sweet Amandine blog. I should warn you – it is a bit of a hassle. First, you rinse your quinoa, then cook it in boiling water until almost tender, then drain it in a sieve, then steam it over boiling water with a tea towel and a lid on top, then rest it for another five to ten minutes. The grains of quinoa stick to the tea towel and the sieve, so there’s more washing up… and you wonder if you can be bothered with this at all. But, trust me, it is worth the bother and, after a few times of doing it this way, it practically feels like no bother at all… because at the end of all this, what you have is perfect, fluffy quinoa which both tastes and feels super good for you. Here it is: super good, perfect fluffy quinoa every time. 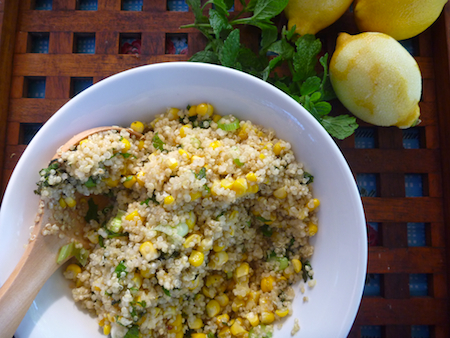 This recipe makes quite a lot of quinoa but I usually make the full amount and recycle the leftovers the next day into some kind of quinoa salad, depending on what vegetables I have on hand. Roasted cauliflower, pumpkin, carrots, baby spinach, cherry tomatoes, feta and nuts are all good. The possibilities are endless. 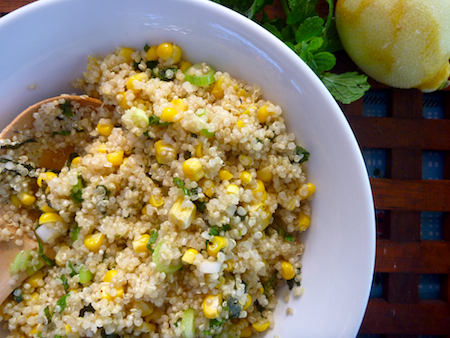 The original recipe calls for four ears of corn kernels – you can leave these out and just have a plain quinoa with spring onions and mint. I usually add the corn, because the combination of corn and quinoa is kind of irresistible for me. ½ cup of chopped fresh mint. Rinse quinoa well in three changes of water to remove bitter coating. Bring about six or seven cups of salted water to the boil in a large saucepan and cook quinoa for about 7–8 minutes (2–3 minutes less than packet instructions) until quinoa is just slightly tender (al dente). Drain quinoa in large sieve, then place sieve on saucepan with about and inch of water simmering below. Cover quinoa with a folded tea towel and lid and steam quinoa over simmering water for about five minutes until quinoa is tender. Be careful not to let the water touch the quinoa in the bottom of the sieve. Remove from heat and let quinoa sit covered with tea towel and lid for another five to ten minutes until tender, fluffy and dry. To make dressing – whisk together oil, lemon juice, zest, honey, salt and pepper. 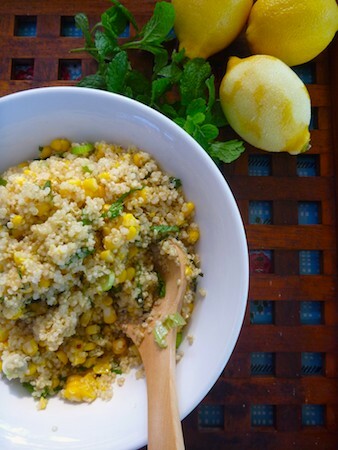 Mix through quinoa and then add spring onion, mint and corn. Taste and add more salt and pepper if desired. This looks great, really simple and delicious. Thanks for sharing! It really is the best way of cooking quinoa. I can attest to it tasting super good too – had the pleasure of eating it at Elizabeth’s last Friday night and went back for seconds, maybe even thirds. I bet this tasted bright and refreshing. Thanks for this recipe. Will try asap as love the kin oh ah! Oh, hooray! I’m thrilled that you’re a quinoa convert. It’s all in the preparation, as you’ve discovered. Amazing what a difference it makes, eh? Everyone who tries it this way is converted. Love your blog by the way.